BLOG — Atlanta Irish Dance by Burke Connolly. INtown Atlanta Irish Dance! Atlanta Irish Dance by Burke Connolly brings you all you need to know about the World of Irish Dance and Irish dancing in Atlanta! We're Back from the WORLD CHAMPIONSHIPS! 2019 St. Patrick's Week of AWESOME! Our Beginner Skirts, Embroidered Leotards, Capes & Headbands! NOTE: Costumes are not mandatory for beginners. If you are not ready to purchases a costume, please read about our PRE-Costume HERE. Our Costumes are HAND MADE & Tailored to your child. You will measure your child and submit the measurements electronically. It is easy! Details on Measuring & Ordering below! NOTE: we have a leotard FIT KIT at the studio. Please try on the leotards to find your size. Girls also need to Order a Headband. Headbands are handmade. Please e-mail Mary Morley at morl1102@aol.com to order. Ask for a Burke Connolly School Headband. Use these Links to order. The links contain the list of measurements you need & helpful photos! Select ZIPPER Skirt, EMBROIDERED Leotard & a CAPE. Need some help with measuring your child? We're here to help! Bring your measurements & a tape measure to class. Your child should wear fitted Tank & Shorts to class for measurements. Do not wear leggings or bulky clothing. Parents, due to time constraints, please MEASURE your child at home and take necessary pictures. We will VERIFY measurements in class. Our Boy’s Vest Costume with a bow tie! It’s important to NOTE: Buying a costume is NOT required, unless you are a member of our Senior Ceili Class (Levels 4 & above)! Basic Black Skirt: Any opaque black skirt that hits 3-4" above the knee will do! ALL BLACK (The PRE-Costume) - Black long-sleeved Leotard & Black Opaque Skirt that hits 3-4” above the knees. Poodle Socks- champion ankle length only!! No knee socks :) Click HERE to order. Girls’ hair should be curled. You can curl hair naturally or purchase a wig. NATURAL CURLS: Curl hair using sponge rollers or pin curls. HOW TO VIDEO on curling Hair with sponge rollers. Do not twist the hair before rolling into the curler. That’s a different look. Take all curlers out the following morning. DO NOT brush the curls out. They should be tight. WIGS: Please talk with your teacher about which wig is preferred, as styles change. Note: Bows are permitted on beginner dancers ages 6 and under ONLY. Boys hair should be Clean and Neat and remain out of the eyes while dancing. • NO make-up is permitted on Beginners under the age of 12. • Light make-up, consisting of light blush, lipstick or lip gloss, and neutral basic eye make-up (no crazy colors like blue!) may be worn on Beginners ages 12 & Over. You might have heard this strange word around the studio by now. Other than performances, a FEIS is something our students LOVE to do! First, a wee bit O'history..
“FEIS” (pronounced FESH) is a Gaelic word that means festival. Many years ago in Ireland, the local towns would hold a Feis where the community would gather--Many entered contests to show their baking, music, dance and art skills. We keep these traditions alive today! At a feis, registrants can compete in a variety of Irish cultural activities. In addition to the dancing competitions, we encourage our dancers and their families to enter the other competitions available: music, baking, singing and art! Even our parents have entered (and won!) baking competition! Yum! What happens at a Feis? 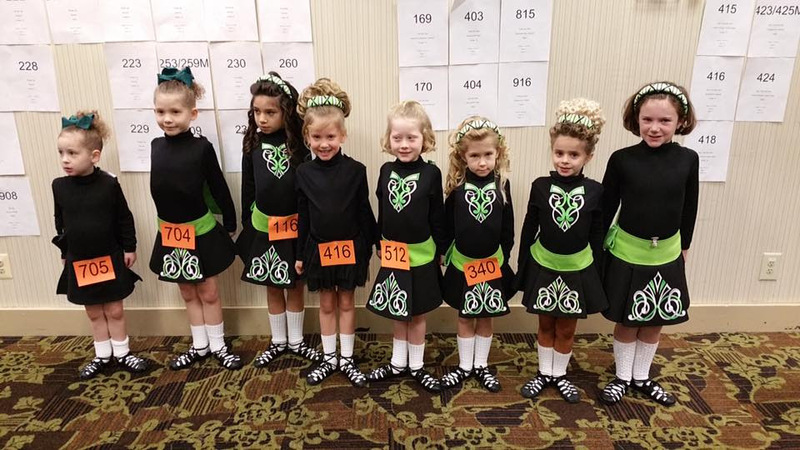 At a Feis, competitors are split into age-groups such as U9 & U10-- meaning "under 9" and "under 10". This is based on the Child's age on January 1st of the current year. Dancers are then split into levels based on their ability and success at previous feiseanna (plural of feis). "What to Expect the Day of the Feis" and "The Beginner Feis Look"
Some of our beginners practicing together at their very first feis! The best way to ensure a fun and exciting feis is to help your dancer feel prepared! In class, we use visualization and roll playing techniques to make sure your dancer knows what to expect when they get on stage. At home, you can help, too! Practicing at home will help ensure that they feel confident about their steps, which is key to creating a healthy relationship with the stage--whether it is at a feis or a performance! Remember, a week between classes feels like a CENTURY to a child! So, we've put together VIDEOS of each dance and skill your child is learning in class! They are all available on our private Students Only Page. From our Homepage, simply scroll to the bottom, click the "Students Only" button and insert the secret password! Which FEIS LEVEL Should My Child Dance In? Keep track of your Dancer's scores and placements from the past year's feiseanna. Once you have those, compare them to the rules below! Remember- Each dance can be in a different level so dancers can be in MULTIPLE Levels at one time! Beginner: A beginner is a competitor who has not taken a full year of Irish Dance lessons, thereby giving beginners a full year with such status. A Beginner must move into the Advanced Beginner category for the next year. Advanced Beginner: An Advanced Beginner who wins 1st, 2nd, or 3rd place will advance to the Novice category in that particular dance. Open (Prizewinner): A competitor who does not qualify as a Beginner, Advanced Beginner or Novice. (see “Novice” for Prizewinner qualifications). NOTE: The status of the dancer does NOT change unless there are five or more dancers in a competition. Competitors have the option to remain in the same category for the remainder of the Feis year (until the following January 1st). After entries have been closed, in any competition where five or more boys are entered, the feis committee will run a separate competition for these boys. A feis committee may only combine two consecutive calendar year age groups (within that grade only) when fewer than five (5) competitors are entered in either age group, with the exception of the oldest age group listed. 2. Never won 1st, 2nd or 3rd in Open Championship. B) A dancer who wins two (2) first place preliminary championship awards in one calendar year will move on to Open Championship the following year (as of Jan 1); if the second first-place win does not occur in the same feis year as the first win, as soon as the second win is achieved, in any age category, the dancer must move up to open championship level immediately. Only in the case of a back-to-back Feiseanna (successive days) the first-place win in the first Feis will not change the dancer’s status for the second Feis. E) Preliminary Championship competitions must be offered separately in the syllabus for the minimum required age groups, yet the feis committee may combine an age group with the next higher age groups if there are fewer than 5 competitors entered in the lower age group. A feis committee is not permitted to combine dancers from one preliminary championship age group with any age group which is more than one age group higher than the age group in which the dancers are entered. NOTE: Placing in a Regional or National Oireachtas does NOT change the status of a competitor. If after competing for two full feis years at the Open Championship level, a dancer has not placed first, second or third, he/she may opt to return to Preliminary Championship status. When dancers practice at home it is important that they use music that is the correct speed. When we perform or compete the musicians use a metronome to ensure they are playing at an appropriate speed for dancers. Below we list the different levels Burke Connolly dancers are in and the dances and speed of music they will need for practicing. Happy practicing! Links to recommended Irish dance socks, soft shoes and hard shoes for our non-champion Irish dancers in Atlanta! Atlanta Irish Dance Performances - What New Parents need to know! WATER. We dance non-stop the entire class. Please ensure you have plenty of water :) No sport drinks or glass bottles. WHITE SOCKS. "Poodle Socks" (info below) are the traditional Irish Dance Socks that our ladies wear at class. Men can wear white sport socks to class. Link for poodle socks are below. At competitions and performances, Ladies wear opaque black tights, and men wear black dress socks. FITNESS TOPS & BOTTOMS. We need to be able to see the dancer's knees & posture. Dancers are encouraged to wear their Burke Connolly T-shirt & black shorts or fitted leggings to class. HAIR should be tied back and away from the face. Also check out: What's in My Irish Dance Bag? A Guide for New Irish Dancers! What’s in My Irish Dance Bag? What to pack in your Irish Dance Bag!